16 Oct 1937 Helm was commissioned into service. 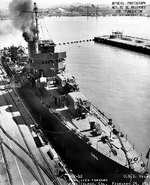 26 Jun 1946 Helm was decommissioned from service. My Father served on this ship during World War 2 1 Class Sonarman. He passed away in 1995. My father Fred Moninger served on the Helm. He was a torpedoman 2c. I would welcome any correspondence regarding this ship or crew. My Father T.C. DuBose GMMC(went to be with the LORD 1987)always told us that the Helm was the ONLY ship underway during the Pearl Harbor attack but they could not use guns to return fire as the magazines were locked for "SECURITY". They could only rescue survivors.It always grieved him. Richard Fletcher (above) Helm Muster Rolls list no Max Fletcher during WWII. There is a Williba Jerdon Fletcher who appears in the Muster Rolls several times from 1940-1942 but no other Fletchers (Muster Rolls only list enlisted men; officers are on a different list that I do not have access to). Your best bet is to request a copy of his service record (easier than it sounds). See: http://www.archives.gov/research/military/ww2/ww2-participation.pdf. My dad Horace "Casey " Falterman was on the Helm for most of WWII including the attack at Pearl Harbor. I am looking for a link to the crew list of the Helm during that time. I was airborne as a Capt in the USAF flying tankers when the 911 Attack occurred. My father (Jack (John) Wolff) served on the helm. I too am looking for a link to the crew list during the Helm's years of duty. Mr. Falterman (#6 above): I am sorry I did not see your comment when it came in on 7 Dec. See my reply to Mr. Wolff (above) re: Muster Rolls. Horace Anthony Falterman, service number 274 59 46, who enlisted 14 Feb 1941 in New Orleans LA, was a Radarman aboard the Helm and appeared to get transferred on and off the ship at various times for training assignments. Interestingly, the Helm Muster Rolls also list a Clifford Paul Falterman, service number 274 40 76, who enlisted 14 Nov 1939 in New Orleans. A brother? I met a guy today at a retirement home in Greenville, South Carolina wearing a USS Helm hat. I asked him about it and he said he served on this ship. He's in his 90's and credible. I got here just Googling the ship name. I need to find out his last name. All I have is first name Pat.